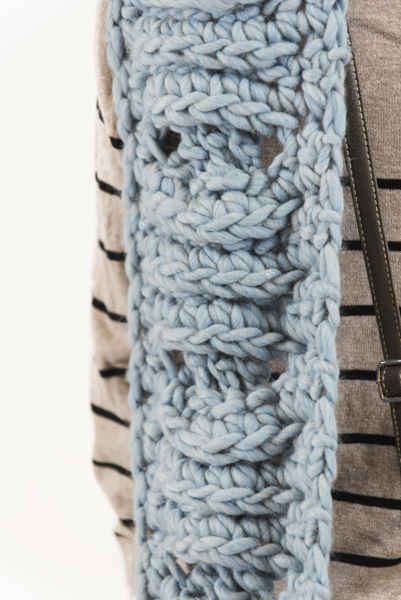 Bulky designs are in, and this oversized braided cable scarf fits the bill. 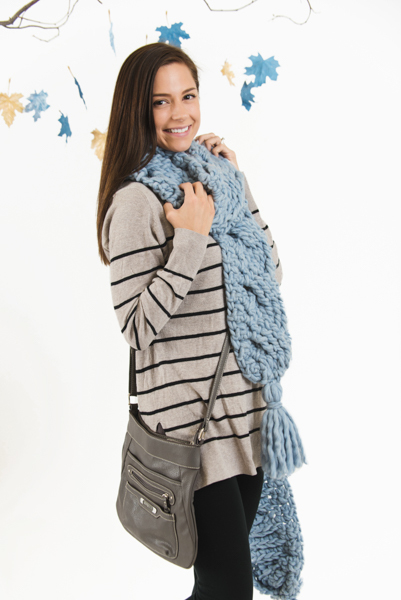 Complete with a fun tassel, this piece will keep you toasty while you explore the great outdoors regardless of the temperature. Gauge: 4 sts and 5 rows = 4” [10 cm] in sc. Yo, insert hook under the post of next st, yo, draw up a lp (3 lps on hook), yo, draw through 2 lps on hook (2 lps on hook), yo, draw through last 2 lps on hook. Yo 3 times, insert hook under the post of next st, yo, draw up a lp (5 lps on hook), yo, draw through 2 lps on hook (4 lps on hook), yo, draw through 2 lps on hook (3 lps on hook), yo, draw through 2 lps on hook (2 lps on hook), yo, draw through last 2 lps on hook. Sk next 3 sts, FPdtr in next 3 sts, going back to first st, FPdtr in first, 2nd and 3rd st. 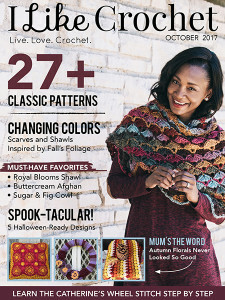 This pattern is worked in the row, from side to side. Row 1: Sc in 2nd ch from hook, sc in next 7 (7, 9) sts, turn – 8 (8, 10) sts. Row 2: Ch 1, sc in same st, sc in next 7 (7, 9) sts, turn – 8 (8, 10) sts. Row 3: Ch 1, sc in same st, FPdc around next 6 sts from 2 rows below, sc in next 1 (1) sts, turn – 8 (8) sts. Row 5: Ch 1, sc in same st, Cable Stitch around next 6 FPdc from 2 rows below, sc in next 1 (1) sts, turn – 8 (8) sts. Row 7: Ch 1, sc in same st, FPdc around next 6 FPdtr from 2 rows below, sc in next 1 (1) sts, turn – 8 (8) sts. Row 9: Ch 1, sc in same st, FPdc around next 6 FPdc from 2 rows below, sc in next 1 (1) sts, turn – 8 (8) sts. Row 3: Ch 1, sc in same st, sc in next st, FPdc around next 6 sts from 2 rows below, sc in next 2 sts, turn – 10 sts. 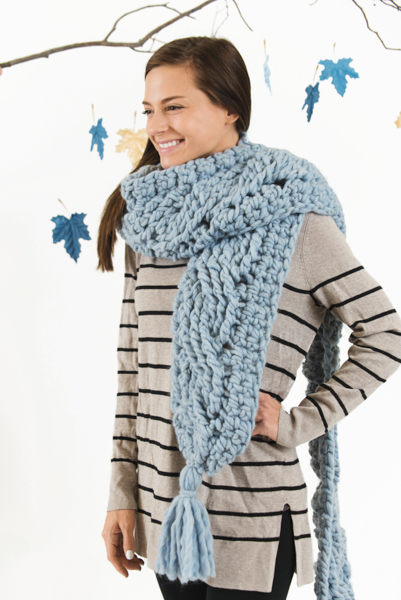 Row 5: Ch 1, sc in same st, sc in next st, Cable Stitch around next 6 FPdc from 2 rows below, sc in next 2 sts, turn – 10 sts. Row 7: Ch 1, sc in same st, sc in next st, FPdc around next 6 FPdtr from 2 rows below, sc in next 2 sts, turn – 10 sts. Row 9: Ch 1, sc in same st, sc in next st, FPdc around next 6 FPdc from 2 rows below, sc in next 2 sts, turn – 10 sts. Row 11: Rep Row 5. Row 13: Rep Row 7. Row 14: Rep Row 2. Row 15: Rep Row 9. Row 16: Rep Row 2. Rows 17-94: Rep Rows 11-16. Row 95: Rep Row 5. Row 96: Rep Row 2. Row 97: Rep Row 7. Row 98: Rep Row 2. Row 99: Rep Row 2. Fasten off. Weave in loose ends. Row 99: Rep Row 9. Row 100: Rep Row 2. Rows 101-106: Rep Rows 11-16. Row 107: Rep Row 5. Row 108: Rep Row 2. Row 109: Rep Row 7. Row 110: Rep Row 2. Row 111: Rep Row 2. Cut 15 strands of yarn 17½” / [44 cm] in length. 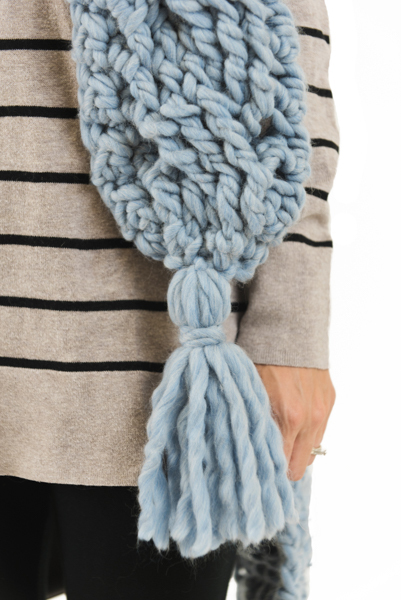 Fold 13 strands in half/double, take the 14th strand and knot it around the centre of the fold, take the 15th strand of yarn and wrap it around the group of 13 (now doubled to 26) strands of yarn, and knot it tightly. Trim tassel to measure 8” / [20 cm]. 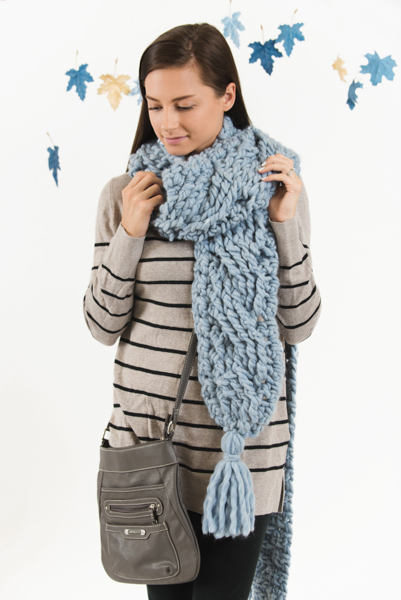 With needle, attach 1 tassel to either end of the scarf, making sure to gather the ends of either side of the scarf together when attaching the tassel. 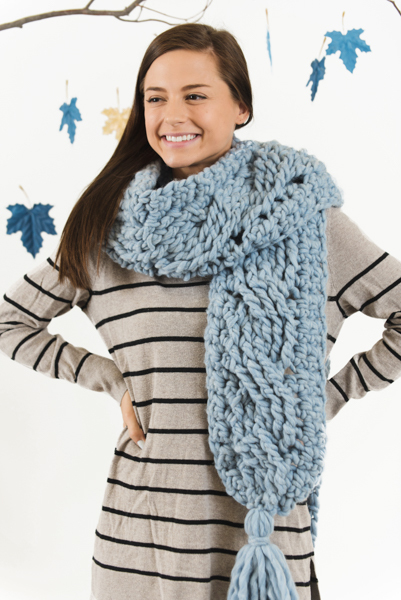 Block scarf to size and shape.